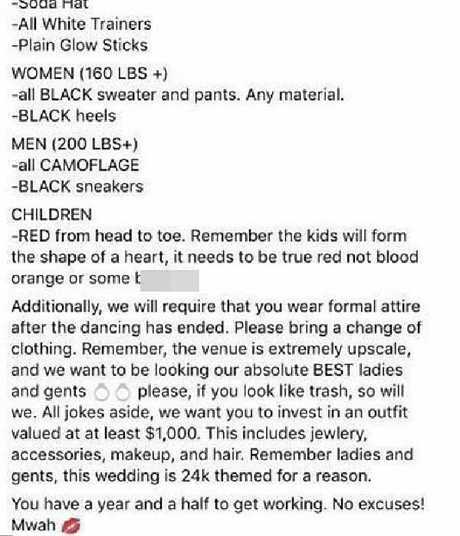 A BRIDE has caused a stir after not only demanding her wedding guests spend at least $1000 on their outfits for her big day, but giving them a strict dress code based on how much they weigh. 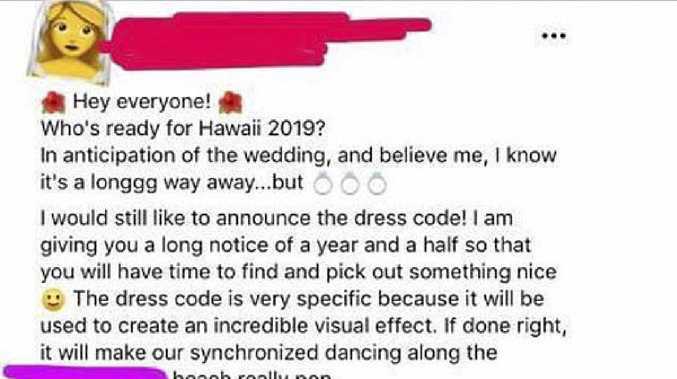 In an insane Facebook post, shared by the Daily Mail, a bride has detailed a list of requirements she expects each guest to meet for her Hawaiian wedding in 2019. 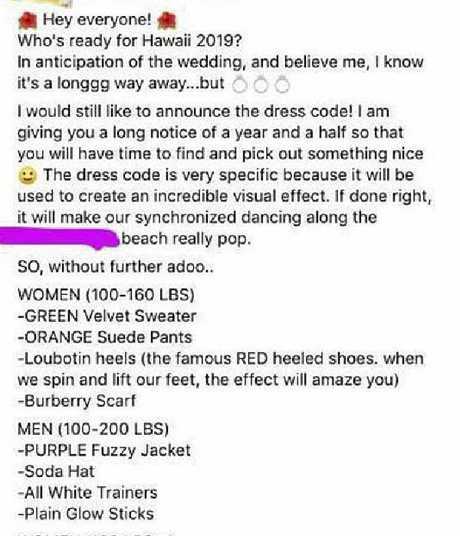 "The dress code is very specific because it will be used to create an incredible visual effect," she wrote. She helpfully broke each dress code into four categories: women weighing between 45kg and 72kg, men weighing between 45kg and 91kg, women weighing above 72kg and men weighing above 91kg. The women in the first category are expected to purchase a green velvet sweater, orange suede pants and Louboutin heels - specifically the "famous red heeled shoes" - and a Burberry scarf to top it off. Just to give you an idea of how much this strange outfit is going to cost the scarf alone can cost between $300 to $1500. 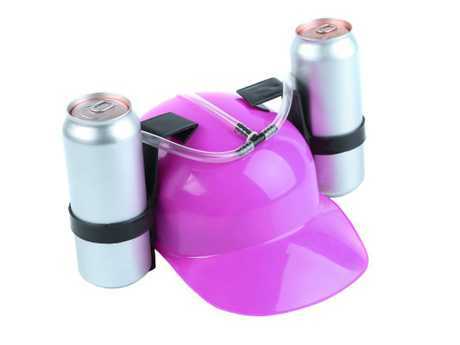 Men who weigh 91kg or less have an even weirder outfit to wear, made up of a purple fuzzy jacket, a soda hat, white sneakers and plain glowsticks. Any female guest who weighs over 72kg has the blessing of being able to wear the most normal outfit out of all the groups, being told to just wear a black sweater, pants and heels. Men who weigh over 91kg will need to be dressed fully in camouflage with black sneakers. The children who attend have a very special role in the dance and are required to be dressed head to toe in red. "Remember the kids will form the shape of a heart, it needs to be true red not blood orange or some bulls**t," the bride wrote. 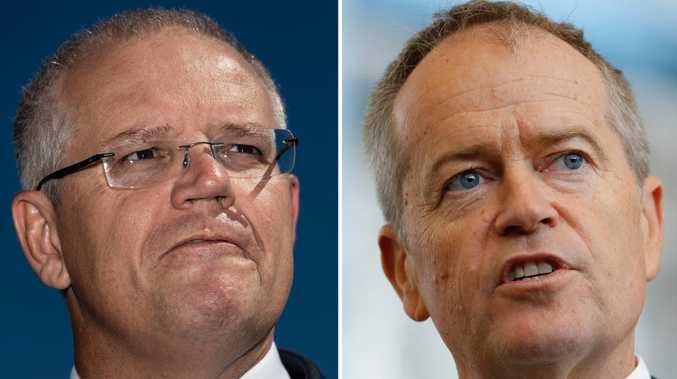 And if all this wasn't enough the guests are also expected to bring a second formal outfit to change into after the odd dance routine part of the wedding has finished. "Remember, the venue is extremely upscale and we want to be looking our absolute best ladies and gents please, if you look like trash, so will we," the post continued. "All jokes aside, we want you to invest in an outfit valued at least $1000." She added that guests wouldn't have any excuse for not getting their outfits sorted in time as the wedding was a year and a half away. And if you were hoping that this whole thing was a big joke then you would be severely disappointed as guests have reportedly posted online confirming the bride was being 100 per cent serious.